1. Preheat the oven to 180°C, gas mark 4. Cook the sweet potato in boiling water for 10 minutes or until just tender, then thinly slice. 2. Warm ½ tbsp olive oil in a medium-sized, deep frying pan over a medium heat. Add the onion and cook gently for 5 minutes until softened and golden. 3. Add the sliced sweet potatoes, then scatter with the spinach and crumbled feta. 4. Beat the eggs and milk together and pour over the mixture, then reduce the heat and cook for 10-15 minutes until the frittata is almost cooked through and starting to brown underneath. 5. 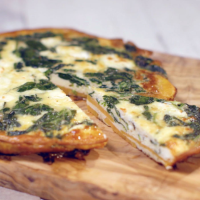 Place the pan in the preheated oven for 4-5 minutes until the frittata is cooked through and lightly browned. 6. To serve, tip onto a rack to cool and then slice. This recipe was first published in Fri Jan 06 13:43:12 GMT 2017.